It isn’t often that Precision Model Arts announces a new product but when they do they typically come with a bit of fanfare. Earlier today we learned that they plan to offer a 1:72 scale replica of a mid production German Tiger E heavy tank (P0330). Based upon a vehicle that served with the infamous schwere SS Panzer Abteilung 101, their first ever Tiger comes with a detachable turret and hull so you can see the interior of the vehicle. As a bonus, the vehicle features an opening engine compartment as well as a removable Maybach HL 230 TRM P45 engine. No doubt recognizing the significance of the upcoming 75th Anniversary of the D-Day invasion, the unit in question harkens back to the fighting in and around the bocage country of Normandy, France, during the fateful summer of 1944. In addition to the Tiger tank, three new figure packs were unveiled. There’s a German engineer set (P0407), the perfect accompaniment to the German Tiger and useful for depicting a field repair depot overhauling a damaged vehicle. Also shown are a set of German Officers (P0408) as well as a group of German Wounded Soldiers (P0409). All of the sets will likely oppose the Allies’ invasion some time this summer. Precision Model Art (PMA) has been rather quiet of late and with good reason. It looks as though the Company has elected to hit the ground running on the hot desert sands of North Africa with their first ever take on the Long Range Desert Group patrol vehicle. Offered up in two paint schemes (P0325 and P0326), the LRDG vehicles come with removable bonnets and entrenching tools, making them ideal for dioramas or wargaming battles. Best of all, both vehicles are scheduled for a third quarter release, and will likely be joined with crew figures to give them an even more realistic look. As we kind of expected while doing research on the German V-2 rocket, PMA has added a third scheme to its Vengeance locker. Slated for a year-end delivery, the third version is clad in a camouflage pattern (P0324), which goes well with two new vehicle schemes also announced (P0318 and P0319). So, if you want a V-2 set that is painted in nearly identical colors from prime mover to launcher, you’ve finally got your wish fulfilled. According to our distributor, PMA’s eagerly awaited pair of V-2 Long-Range Guided Ballistic Missiles are on the launch pad and expected to hurtle down on the diecast community in a matter of days. For those of you unfamiliar with their newest piece of diecast, the V-2 (German: Vergeltungswaffe 2, “Retribution Weapon 2”), technical name Aggregat 4 (A4), was the world’s first long-range guided ballistic missile. The missile with a liquid-propellant rocket engine was developed during the Second World War in Germany as a “vengeance weapon”, assigned to attack Allied cities as retaliation for the Allied bombings against German cities. The V-2 rocket also became the first artificial object to travel into outer space by crossing the Karman line with the vertical launch of MW 18014 on June 20th, 1944. Research into military use of long range rockets began when the studies of graduate student Wernher von Braun attracted the attention of the German Army. A series of prototypes culminated in the A-4, which went to war as the V-2. Beginning in September 1944, over 3,000 V-2s were launched by the German Wehrmacht against Allied targets, first London and later Antwerp and Liege. According to a 2011 BBC documentary, the attacks from V2s resulted in the deaths of an estimated 9,000 civilians and military personnel, and a further 12,000 forced laborers and concentration camp prisoners died as a result of their forced participation in the production of the weapons. As Germany collapsed, teams from the Allied forces — the United States, the United Kingdom, and the Soviet Union — raced to capture key German manufacturing sites and technology. Wernher von Braun and over 100 key V-2 personnel surrendered to the Americans. Eventually, many of the original V-2 team ended up working at the Redstone Arsenal. The US also captured enough V-2 hardware to build approximately 80 of the missiles. The Soviets gained possession of the V-2 manufacturing facilities after the war, re-established V-2 production, and moved it to the Soviet Union. PMA is releasing two versions of the V-2: one in a black and white test scheme (P0321) and the other in a dark green operational scheme (P0322). Both come with a Meillerwagen launch trailer and Brennstand (firing stand). Please note that the Meillerwagen and Brennstand are composed of diecast metal while the V-2 is made of plastic. 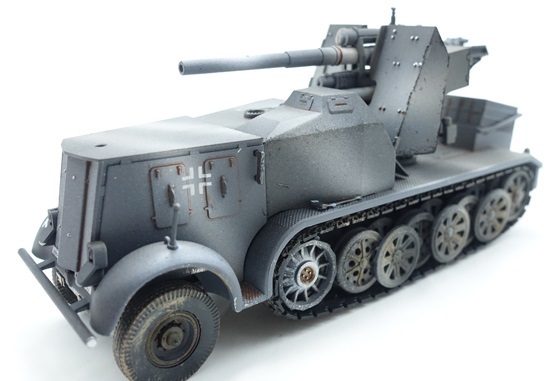 As a natural extension to their previously released Sd.Kfz.8 series of prime movers affixed with FLaK guns, Precision Model Art announced their intent to produce two more similarly conceived vehicles. The first (P0315) represents a heavy prime mover (Schwerer Zugkraftwagen) with bench seating for the gun crew and painted in an early war field grey. The alternative vehicle is a Gepanzerte or armored prime mover (P0316), better protected against small arms fire on the battlefield and even equipped with a pair of MG-34 machine guns fore and aft. Both vehicles are expected in June and, as we’ve come to expect from PMA based upon past experience, will likely be followed up shortly with other liveries. Long serving as the manufacturing arm for Blitz 72, PMA has stepped out of the shadows and is now producing its own line of 1:72 scale military hardware. Expected in September is this Sd. Kfz. 8 DB9 prime mover which mounts a FlaK 18 88mm anti-aircraft gun on the rear bed. Painted in a whitewashed camouflage scheme and bearing loads of incredible detail, this main stay of the Wehrmacht fills a niche long neglected by the other model makers.